Received July 20, 2018; Revised November 8, 2018; Accepted December 6, 2018. The antimicrobial activity of acetone, hexane, dichloromethane, and methanol extracts from leaves, stems, immature green fruits, and red fruits of tomato plants was examined against six phytopathogens. The minimum inhibitory concentration (MIC) of the acetonic extracts from these four plant parts was lower than that of the other solvents. Among the acetonic extracts, tomato leaves had a lower MIC than the other tomato parts. The acetonic extract from tomato leaves was therefore selected as a source of antimicrobial substances. The acetonic extract from tomato leaves inhibited mycelial growth of Fusarium oxysporum f. sp. lycopersici, Glomerella cingulata, and Rhizoctonia solani. Mycelial growth of R. solani treated with acetone extract from leaves showed more susceptibility than the other phytopathogens. Using 0.31 mg/ml of the acetonic extract from leaves, mycelial growth of R. solani on days 1, 2, and 3 decreased by 50.0, 52.1, and 64.0%, respectively, compared with acetone solvent treatment. The antimicrobial compounds effective against R. solani were identified as linolenic acid and caffeic acid by bioautography and GC-MS. These two compounds were used to treat six phytopathogens to confirm their antimicrobial activities. Linolenic acid inhibited mycelial growth of R. solani, while caffeic acid showed only slight antimicrobial activity. Results indicated that we propose extracts from tomato leaves which included antimicrobial compounds may provide a new lead in the pursuit of new biological sources of agrochemical candidates. ‘Bacchus’ tomato plants (Monsanto Korea, Jochiwon, Korea) were transplanted in a greenhouse located in Gwangju (N 35.26°, E 126.74°), Korea, on August 19, 2011. Their leaves, stems, and fruits were harvested on May 15, 2012. The fruits were classified at six ripening stages (immature green, mature green, breaker, turning, pink, light red, red, and deep red) according to USAD standards (https://ucanr.edu/repository/view.cfm?article=83755%20&groupid=9). The fruits of immature green and red stages were selected for this study. Samples at each stage were separately stored at −20°C until antimicrobial and phytochemical analyses were performed. The extraction was performed according to the method of Mahlo et al. (2010). Finely ground materials of the leaves, stems, and fruits (4 g) were extracted with 40 ml of hexane, dichloromethane, acetone, or methanol in polyester plastic tubes with strong shaking on a shaker for 5 min. After centrifuging at 13,300 g for 5 min, the supernatants were decanted into weighed glass vials. The process was repeated three times, and the extracts were mixed. The solvents were evaporated under a stream of cold air at room temperature. Fungi and oomycetes pathogenic to tomato plants (Colletotrichum coccodes (KACC 40802), Fusarium oxysporum f. sp. lycopersici (KACC 40043), and Phytophthora capsici (KACC 40177)) and those pathogenic to strawberry plants (Glomerella cingulata (KACC 40300), Phytophthora cactorum (KACC 40183), and Rhizoctonia solani (KACC 40115)) were provided by the Genebank Information Center, Rural Development Administration, Jeonju, Korea. All microbial strains were maintained on potato dextrose (PD) agar in a chamber maintained at 25°C until antimicrobial and phytochemical analyses were performed. The microdilution assay for antifungal activity was performed according to the method of Masoko et al. (2005). Residues of the hexanic, dichloromethanic, acetonic, and methanolic extracts were dissolved in hexane, dichloromethane, acetone, and methanol to a concentration of 10 mg/ml, respectively. The plant extracts (100 μl) were repeatedly diluted in a 1:1 ratio by volume with distilled water in 96-well microtiter plates. Microbial cultures (100 μl) in PD broth were added to each well. p-Iodonitrotetrazolium violet (40 μl at 0.2 mg/ml) was dissolved in distilled water and added to each of the microtiter plate wells as an indicator of microbial growth. The covered microtiter plates were incubated for 2 to 3 days at 35°C and 100% relative humidity (RH). PD agar medium (100 ml) was prepared with the solvents or the tomato plant extracts by adding distilled water. The mixtures were placed into Petri dishes. Mycelia of the fungi and oomycetes were placed in the center of each Petri dish and incubated in a growth chamber at 26°C and 50% RH. The mycelial diameter was measured twice with a ruler over a span of seven days, and the two measurements were averaged. 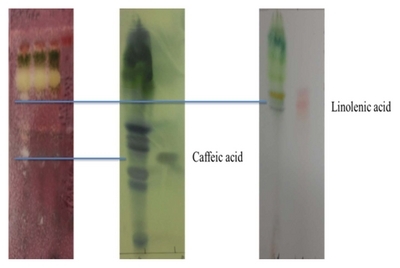 Bioautography using thin layer chromatography (TLC) was performed through the method of Mahlo et al. (2010). The TLC plates were loaded with 100 μg of each of the extracts in a line 10 mm wide. The prepared plates were developed using eluent that consisted of toluene:ethyl acetate:methanol:formic acid (6:4:2:1, v/v/v/v). The developed plates were sprayed with a concentrated suspension containing 1.0 × 106 cells/ml of actively growing microorganisms. After overnight incubation, the plates were sprayed with a 2 mg/ml solution of p-iodonitrotetrazolium violet and again incubated overnight in a chamber at 35°C and 100% RH in darkness. The developed plates were visualized and inspected by reagents and UV lights and then used for GC-MS identification. The active compounds were scraped off and placed in vials with solvent. The vials were shaken for 10 min and centrifuged for separation of the compounds and silica gel. The supernatant was collected and placed in clean vials. The GC-MS spectra were recorded on a Thermo TRACE1310 instrument equipped with Thermo ISQ LT (Thermo Fisher Scientific, Waltham, MA, USA), operating under EI mode at 70 eV. An HP-5 MS column (30 m × 0.25 mm × 0.5 μm film thickness) was used to separate the antimicrobial compounds. The temperature was set to 50°C for 2 min, followed by a temperature gradient of 50–325°C (increasing by 10°C/m) and holding at 325°C for 10 min. The injector temperature was 300°C. The flow rate of helium as a carrier gas was 1.5 ml/min. The mass spectra were deconvoluted by AMDIS® software (NIST, Gaithersburg, MD, USA). The compounds were identified by comparing their mass spectral fragmentation and retention times with those of reference compounds isolated in our laboratory or supplied from other laboratories or with standard reference spectra from the database of the National Instrumentation Center for Environmental Management, Seoul National University (Seoul, Korea). Quantitative analysis of the antimicrobial compounds was performed using an HPLC system (Ultimate 3000, Dionex, Sunnyvale, CA, USA). A Zorbax ODS C-18 column (150 × 4.6 mm i.d. 5 μm; Young Jin Biochrom Co., LTD, Seongnam, Korea) was used for the analysis. The extract was filtered through a syringe filter (0.45 μm pore size) before injection into the HPLC apparatus. The mobile phase consisted of 0.3% trifluoroacetic acid (phase A) and acetonitrile (phase B). Separation was carried out for 40 min under the following conditions: from 0 to 25 min, 90% (A) and 10% (B); from 25 to 30 min, 40% (A) and 60% (B); from 30 to 35 min, 100% (B); from 35 to 40 min, 90% (A) and 10% (B). The eluted components were monitored using a UV/Vis detector at 280 and 340 nm. The standard chemicals of caffeic and linolenic acids were purchased from Sigma-Aldrich. The MIC values of extracts from tomato leaves were especially low (Table 1). Kim et al. (2014) reported that tomato leaves contain more pesticidal phenolic compounds and alkaloids than other tomato parts. Previous research has shown that leaves of other plants have antimicrobial activity against phytopathogens. For example, leaf extract of sweet William catchfly (Silene armeria L.) inhibited growth of Botrytis cinerea, Colletotrichum capsici, Fusarioum solani, F. oxysporum, Phytophthora capsici, and Rhizoctonia solani (Bajpai et al., 2008). This result is meaningful in agronomy because tomato plants are grown worldwide and harvest index of tomato is about 33% (Salisbury et al., 1997). Therefore, there may be no trouble with raw material supply and tomato farmers can earn additional income. Determination of an extract solvent was also important because MIC values of tomato leaves depend on solvent polarity. Jayaraman et al. (2008) reported that the greater antimicrobial activity of the acetone extract might be due to the higher solubility of the extract in organic solvents. Acetone, moreover, can be a solvent used for polar and non-polar compounds because its solvent strength is 5.1 (compared to a median value of 0 for hexane and 10.2 for water). The acetonic extract from tomato leaves can contain more diverse biochemicals (including antimicrobial compounds) than the solvent extracts of the other tomato parts. Therefore, the acetonic extract from tomato leaves could be most useful as an antimicrobial agent. The acetonic extract from tomato leaves showed antimicrobial activity against all six pathogens. Among the phytopathogens, Rhizoctonia solani was the most susceptible to the acetonic extract from tomato leaves, with an MIC less than 0.31 mg/ml (Table 1). Previous research has also shown that certain plant extracts show antifungal activities against R. solani (Castillo et al., 2010; Jasso de Rodríguez et al., 2007; Osorio et al., 2010; Tapwal et al., 2011). Likely candidates for antimicrobial compounds active against R. solani are phenolic acids (Francisco and Cooper-Driver, 1984), isoflavonoids (Smith, 1976; Weidenbörner et al., 1990), saponins (Kuo et al., 2010), monoterpenes (Kordali et al., 2008), alkaloids (Abdel-Motaal et al., 2010), or fatty acids (Walters et al., 2004). Tomato leaves contain diverse secondary metabolites including phenolic acids, monoterpenes, alkaloids (Kim et al., 2014), and fatty acids (Conconi et al., 1996). In addition, phenolic compounds and fatty acids are generally extracted with acetone (Krygier et al., 1982; Rouser et al., 1967). These results indicate that the acetonic extract of tomato leaves might include antimicrobial phenolic acids and/or fatty acids. 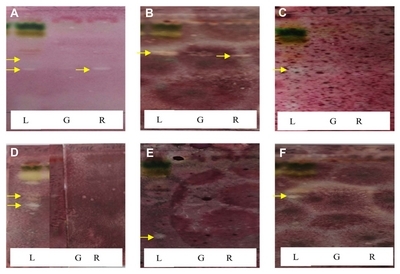 The acetonic extract from tomato leaves inhibited mycelial growth of Fusarium oxysporum, Glomerella cingulata, and Rhizoctonia solani compared to acetone solvent treatment (Fig. 1). F. oxysporum, G. cingulata, and R. solani are ubiquitous soil inhabitants that can colonize plant roots, stems, and leaves, suggesting that the acetonic extract from tomato leaves can be used as a soil disinfectant. Among these three fungi, mycelial growth of R. solani was most strongly inhibited by the acetonic extract of tomato leaves, and this fungus provided the extract’s lowest MIC value: with 0.31 mg/ml of extract, mycelial growth of R. solani on days 1, 2, and 3 decreased by 50.0, 52.1, and 64.0%, respectively, compared with acetone solvent treatment (Fig. 1). This result demonstrated the inhibitory effect of the acetonic extract from tomato leaves on mycelial growth of R. solani over time. During TLC-direct bioautography detection for antimicrobial compounds from the acetonic extracts of tomato plant, so-called inhibition zones (creamy and white areas) were found around all tested microorganisms exposed to the acetonic extracts of tomato leaves and red fruits (Fig. 2). The acetonic extracts of tomato leaves possessed 1–2 antimicrobial compounds for all of the microbial species used in this study, while the extracts of red fruits contained only one compound for Colletotrichum coccodes and Fusarium oxysporum, R. solani, the microorganism most susceptible to the acetonic extracts from tomato leaves, showed two inhibition zones. GC-MS analysis revealed that the antifungal compounds in the two inhibition zones were linolenic acid and caffeic acid. 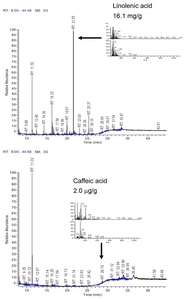 Specifically, linolenic acid at 16.1 mg/g and caffeic acid at 2.0 μg/g were found to be the dominant compounds in both inhibition zones by HPLC analysis (Fig. 3). Linolenic acid and caffeic acid were also visualized on a TLC plate and migrated the same distance as the antimicrobial compounds in phosphomolybdic or anisaldehyde-sulfuric acid (Fig. 4). Conconi et al. (1996) reported that linolenic acid, an acetone-soluble lipid, is a major component of the total lipids in tomato leaves. Even though it is not a secondary metabolite, its antimicrobial activity has often been demonstrated. For instance, Walters et al. (2004) reported that linolenic acid decreased mycelial growth and fungal biomass of R. solani, Pythium ultimum, Pyrenophora avenae, and Crinipellis perniciosa. Hamberg (1999) reported that linolenic acid was a substrate for the production of a range of trihydroxy oxylipins known to possess antifungal activity. San Francisco and Cooper-Driver (1984) confirmed that caffeic acid showed antifungal activity against fungi (R. solani, Pythium debaryanum, P. middletonii, and P. ultimum) and bacteria (Corynebacterium poinsettiae, C. fasciens, Erwinia amylovora, and E. carotovora). With linolenic acid at 1.00 mg/ml, mycelial growth of R. solani on day 3 was reduced by 51.9% compared with acetone solvent treatment. Walters et al. (2004) reported that linolenic acid at 100 and 1,000 μM decreased mycelial growth of R. solani by 51.2 and 69.8%, respectively. 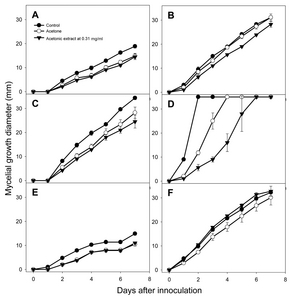 Caffeic acid at 0.10 and 1.00 mg/ml inhibited the mycelial growth of R. solani on day 4 (Fig. 5). Al-Mughrabi et al. (2001) also reported that caffeic acid showed weak antifungal activity against R. solani. These results indicate that linolenic acid and caffeic acid from tomato extracts are antimicrobial compounds against R. solani, and that these two substances can be used in commercial products as natural antifungal agents. In MIC tests, the acetonic extracts from tomato leaves had the greatest antimicrobial activity against the tested phytopathogenic microorganisms. Among the tested phytopathogens, Rhizoctonia solani showed significantly inhibited mycelial growth after application of the acetonic extract from tomato leaves. Based on the bioautography results, linolenic acid and caffeic acid were found to be effective antimicrobial compounds against R. solani. These results demonstrate the potential of tomato leaves as a source of extracts or pure compounds with activity against R. solani and other fungal phytopathogens. Profiling and MIC results showed that other parts of the tomato plant also contained antimicrobial compounds, but their antimicrobiotic activities were comparatively lower. Together, our results suggest that tomato leaves, a major non-edible plant part that can be collected after training branches and at the end of cultivation, are a potential source of natural antimicrobial agents. Moreover, we found out the major antimicrobial compounds in the extract from tomato leaves in this study. This result can be scientific evidence for the antimicrobial activity of the extract. This study was supported by Rural Development of Administration (C.C. PJ010822). The URL is [http://atis.rda.go.kr/rdais/main/main.vw]. Fig. 1. Inhibitory effect of acetonic extract from tomato leaves on mycelial growth of six microorganisms. (A) Colletotrichum coccodes; (B) Fusarium oxysporum; (C) Glomerella cingulata; (D) Rhizoctonia solani, (E) Phytophthora cactorum; (F) P. capsici. Vertical bars represent standard errors of the means. Fig. 2. Bioautogram of acetonic extracts from leaves (L), immature green fruits (G), and red fruits (R) of tomato plants. White areas indicate inhibition of microbial growth. (A) Colletotrichum coccodes; (B) Fusarium oxysporum; (C) Glomerella cingulata; (D) Rhizoctonia solani; (E) Phytophthora cactorum; (F) P. capsici. Fig. 3. GC-MS chromatogram of preparative TLC-isolated compounds in acetonic extract from tomato leaves. Fig. 4. Linolenic and caffeic acids visualized on TLC using phosphomolybdic acid and anisaldehyde-sulfuric acid. Fig. 5. 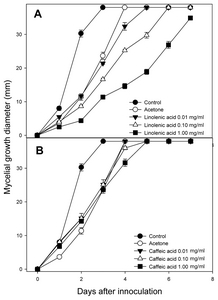 Inhibitory effect of linolenic (A) and caffeic acids (B) on mycelial growth of Rhizoctonia solani. Vertical bars represent standard errors of the means. Abdel-Motaal FF, El-Zayat SA, Kosaka Y, El-Sayed MA, Kashima R, Maeda Y, Nassar MSM, and Ito S. 2010. Antifungal activities of hyoscyamine and scopolamine against two major rice pathogens: Magnaporthe oryzae and Rhizoctonia solani. J Gen Plant Pathol 76: 102-111. Al-Mughrabi K, Aburjai TA, Anfoka GH, and Shahrour W. 2001. Antifungal activity of olive cake extracts. Phytopathol Mediterr 40: 240-244. Bajpai VK, Shukla S, and Kang SC. 2008. Chemical composition and antifungal activity of essential oil and various extract of Silene armeria L. Bioresour Technol 99: 8903-8908. Castillo F, Hernández D, Gallegos G, Mendez M, Rodrîguez R, Reyes A, and Aguilar CN. 2010. In vitro antifungal activity of plant extracts obtained with alternative organic solvents against Rhizoctonia solani Kühn. Ind Crops Prod 32: 324-328. Conconi A, Miquel M, Browse JA, and Ryan CA. 1996. Intracellular levels of free linolenic and linoleic acids increase in tomato leaves in response to wounding. Plant Physiol 111: 797-803. Hamberg M. 1999. An epoxy alcohol synthase pathway in higher plants: biosynthesis of antifungal trihydroxy oxylipins in leaves of potato. Lipids 34: 1131-1142. Iijima Y, Nakamura Y, Ogata Y, Tanaka K, Sakurai N, Suda K, Suzuki T, Suzuki H, Okazaki K, Kitayama M, Kanaya S, Aoki K, and Shibata D. 2008. Metabolite annotations based on the integration of mass spectral information. Plant J 54: 949-962. Jasso de Rodríguez DJ, Hernández-Castillo D, Angulo-Sánchez JL, Rodríguez-García R, Villarreal Quintanilla JA, and Lira-Saldivar RH. 2007. Antifungal activity in vitro of Flourensia spp. extracts on Alternaria sp., Rhizoctonia solani, and Fusarium oxysporum. Ind Crops Prod 25: 111-116. Jayaraman S, Manoharan MS, and Illanchezian S. 2008. Invitro antimicrobial and antitumor activities of Stevia rebaudiana (Asteraceae) leaf extracts. Trop J Pharm Res 7: 1143-1149. Kim DS, Na H, Kwack Y, and Chun C. 2014. Secondary metabolite profiling in various parts of tomato plants. Korean J Hortic Sci Technol 32: 252-260. Kordali S, Cakir A, Ozer H, Cakmakci R, Kesdek M, and Mete E. 2008. Antifungal, phytotoxic and insecticidal properties of essential oil isolated from Turkish Origanum acutidens and its three components, carvacrol, thymol and p-cymene. Bioresour Technol 99: 8788-8795. Krygier K, Sosulski F, and Hogge L. 1982. Free, esterified, and insoluble-bound phenolic acids. 1. Extraction and purification procedure. J Agric Food Chem 30: 330-334. Kuo PC, Lin TC, Yang CW, Lin CL, Chen CF, and Huang JW. 2010. Bioactive saponin from tea seed pomace with inhibitory effects against Rhizoctonia solani. J Agric Food Chem 58: 8618-8622. Mahlo SM, McGaw LJ, and Eloff JN. 2010. Antifungal activity of leaf extracts from South African trees against plant pathogens. Crop Prot 29: 1529-1533. Masoko P, Picard J, and Eloff JN. 2005. Antifungal activities of six South African Terminalia species (Combretaceae). J Ethnopharmacol 99: 301-308. Moco S, Bino RJ, Vorst O, Verhoeven HA, de Groot J, van Beek TA, Vervoort J, and de Vos CH. 2006. A liquid chromatography-mass spectrometry-based metabolome database for tomato. Plant Physiol 141: 1205-1218. Moco S, Capanoglu E, Tikunov Y, Bino RJ, Boyacioglu D, Hall RD, Vervoort J, and de Vos CH. 2007. Tissue specialization at the metabolite level is perceived during the development of tomato fruit. J Exp Bot 58: 4131-4146. Osorio E, Flores M, Hernández D, Ventura J, Rodríguez R, and Aguilar CN. 2010. Biological efficiency of polyphenolic extracts from pecan nuts shell (Carya illinoensis), pomegranate husk (Punica granatum), and creosote bush leaves (Larrea tridentata Cov.) against plant pathogenic fungi. Ind Crops Prod 31: 153-157. Østensvik Ø, Skulberg OM, Underdal B, and Hormazabal V. 1998. Antibacterial properties of extracts from selected planktonic freshwater cyanobacteria - a comparative study of bacterial bioassays. J Appl Microbiol 84: 1117-1124. Rouser G, Kritchevsky G, Simon G, and Nelson GJ. 1967. Quantitative analysis of brain and spinach leaf lipids employing silicic acid column chromatography and acetone for elution of glycolipids. Lipids 2: 37-40. Salisbury FB, Gitelson JI, and Lisovsky GM. 1997. Bios- 3: Siberian experiments in bioregenerative life support. BioScience 47: 575-585. Salunkhe DK, Jadhav SJ, and Yu MH. 1974. Quality and nutritional composition of tomato fruit as influenced by certain biochemical and physiological changes. Qual Plant 24: 85-113. San Francisco M, and Cooper-Driver G. 1984. Anti-microbial activity of phenolic acids in Pteridium aquilinum. Amer Fern J 74: 87-96. Smith DA. 1976. Some effects of the phytoalexin, kievitone, on the vegetative growth of Aphanomyces euteiches, Rhizoctonia solani and Fusarium solani f. spphaseoli. Physiol Plant Pathol 9: 45-48. Tapwal A, Garg S, Gautam N, and Kumar R. 2011. In vitro antifungal potency of plant extracts against five phytopathogens. Braz Arch Biol Technol 54: 1093-1098. Walters D, Raynor L, Mitchell A, Walker R, and Walker K. 2004. Antifungal activities of four fatty acids against plant pathogenic fungi. Mycopathologia 157: 87-90. Weidenbörner M, Hindorf H, Jha HC, Tsotsonos P, and Egge H. 1990. Antifungal activity of isoflavonoids in different reduced stages on Rhizoctonia solani and Sclerotium rolfsii. Phytochemistry 29: 801-803.